Throughout the course of his career with Swaziland’s Ministry of Justice and High Court and various NGOs in Swaziland, Ghana and South Africa, Mr Dube has lamented the absence of criminal defenders, as well as the horrid prison conditions, and the inefficient mechanisms for processing criminal cases. Despite the discouraging obstacles he faces in his line of work, Dube has a selfless commitment to improving Swaziland’s justice system. In 2003, Dube and two other colleagues created a labor consultancy firm that offered legal advice to workers in the textile industry. Dube’s commitment to people drives him to continually push for social rights reforms in Swaziland. Between 2004 and 2007, Dube worked with Yonge Nawe Environmental Action Group where he investigated human rights violations by park rangers and uncovering allegations of murder and assault. During this period, he saw rampant abuse of suspects, often while they were in police custody. Those who were harassed and accused were often men and women who were ignorant of their rights. He also saw that reforms were needed in the media, as newspapers and television programs focused on the most sensational aspects of cases, often resulting in a public conviction even before the case could be heard. As a law researcher at the Constitutional Court of South Africa to Justice T.H. Madala, Dube’s passion for constitutional litigation and human rights was cemented. 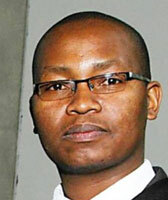 He returned to Swaziland to take a position as a lecturer at the University of Swaziland teaching law. Dube also became a partner at his law firm and currently serves on the board for the Centre for Human Rights and Development. He has volunteered his legal services to an NGO in Swaziland called One Circle that focuses on empowering women and children. Swaziland operates under a dual legal system, in which only the most serious cases are tried by Magistrate courts. Those men and women left to be tried before Customary courts are legally mandated to face the judge without the benefit of legal representation or the presentation of evidence in their favor. When the court system was launched, it was the decision of the prosecutor to determine the judicial venue. Since that time, however, such decisions have been left to the arresting officer. The resulting leverage gained by these officers has led to an environment ripe with torture, wrongful convictions, and corporal punishment – as officers seek to extract bribes, carry out personal vendettas, and control the mechanics of justice. The commitment of Mr Dube against the systematic use of torture which afflicts Swaziland started with the organization of workshops at the Mbhuleni Community Police. Numerous other workshops were organized for different audiences and on various issues such as the rights of the child and the rights of people living with HIV/AIDS. In addition, he managed to enter into contact with both exponent of the Parliament and staff of the courts. It should be noted that the positive attitude of the latter towards the Project allowed Mr Dube and his team to monitor judicial proceedings in order to intervene when violations of human rights were likely to occur. The Press was involved and it reported on the workshops organized by Mr Dube, contributing in increasing the awareness about the Project. In addition, the JusticeMakers Program was one of the main protagonists of a documentary about the Human Rights situation in Swaziland. Mr Dube was also active at the University of Swaziland where he managed to organize a talk about the Project’s activities and to provide general information about the right not to be tortured and the rights of persons affected by HIV/AIDS. Last but not least, with his Project, Mr Dube successfully helped a victim of abuse to present his case in front of the court. These great results have been achieved with the support and collaboration of, among others, the Centre for Human Rights and Development, AMICALL and Advocates International.